What makes a good power supply? Well the simple answer to that question from a computer enthusiasts perspective is that it must have a sufficiently high output wattage to handle top of the line components; be it a high power CPU, multiple videocards, or a RAID array of hard drives. Furthermore, it should be power efficient, and quiet in operation. Most importantly among the list of specs and numbers is how that total power of a PSU is split up between the various voltage rails. Generic manufacturers pump up the overall wattage value by inflating the amount of power that can be delivered on the +3.3V and +5V rails, and this is useless for enthusiasts since high powered devices draw power off the +12V rail these days. There should be at least 35A to 40A on the combined 12V rails for any true SLI-ready powersupply, and if the values are lower than this you're better off to stay away. Seasonic might not be the first name you think of when it comes to power supplies, but it should be near the top of the list. In the last couple of years Seasonic has introduced a flurry of efficient power supplies that operate quietly, virtually all the units we've tested employ Active Power Factor Correction (A-PFC) which greatly reduces the amount of energy wasted. Seasonic has over 30 years of power supply manufacturing experience under its belt, and makes its own power supplies rather than just remarking OEM models as many in the murky world of 'enthusiast' gear do. Seasonic's flagship power supply this summer is the S12 Energy Plus SS-650HT 650W model. From what we've seen thus far, this power supply should fit nicely into the same category as PC Power & Cooling, Fortron Group and Silverstone units, that's some pretty select company! The Seasonic S12 Energy Plus SS-650HT 650W is SLI certified, and that itself should be a sign of what's to come. It is fully ATX 2.0 compatible and has an energy efficiency rating above 80%. The Seasonic S12 SS5-HT power supply is just about to hit the retail markets, and when it does it will retail for about $160USD ($180CDN, 90GPB). Considering what you get in the SS-650HT though, that's still a pretty good price from a proven manufacturer. The Seasonic S12 Energy Plus SS-650HT 650W is standard ATX dimensions (139 x 150 x 85mm) which is good news if you're using a tight case. Many of the enthusiast class power supplies that are 500W+ are physically longer than the Seasonic S12 Energy Plus SS-650HT, and at times this causes space restrictions by the optical drives. Please note that the Seasonic S12 Energy Plus SS-650HT only has one exhaust fan, so it's vital that it is not blocked. 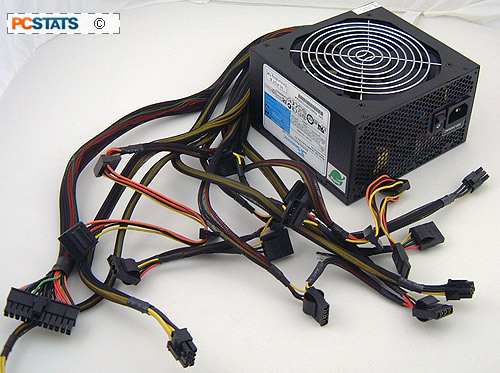 The S12 Energy Plus SS-650HT sports a native 24 pin ATX power connector which by design is still compatible with older 20 pin motherboards because pins 21-24 are detachable. On a side note, it's nice how power supply manufacturers are looking out for consumers by including four case screws in the box too. According to the Seasonic label, the +3.3V line can deliver a maximum of 24Amps while the +5V rail can deliver 30Amps. Total output for the +3.3V and +5V rails is 170W. There are four +12V rails on the SS-650HT and each can deliver a maximum of 18Amps apiece with total power output of 455W. While the amperage ratings might look a bit low at first glance, it's important to make the distinction that Seasonic list sustained values, not peak. The S12 Energy Plus SS-650HT uses Active Power Factor Correction (A-PFC) to improve efficiency, reduce heat, and use less power. A-PFC circuitry eliminates the need for an external voltage level switch (115/230) on the powersupply since it automatically works with a wider voltage range (115VAC of North America to 230VAC of Europe) by default. he 80 PLUS program is a North American electric utility funded initiative that promotes the use and manufacturing of energy efficient power supplies for desktop and server computers. So far twenty power supply manufacturers have signed up for certification and those that pass may display the 80 PLUS logo on its products. If a power supply passes the 80 PLUS certification test, it means the unit is capable of 80% efficiency with 20%, 50% and 100% power loads. 80 PLUS carries so much weight that the new ENERGY STAR specification has also adopted the 80 PLUS standard. These new requirements are expected to take effect in late 2007 on a larger scale. For more information on 80 PLUS, you can visit the website . If you've purchased any computer components the last little while you've probably noticed the little garbage can with an X running in front of it, that is the RoHS symbol. Restriction of Hazardous Substances (RoHS ) is a European Union initiative which targets electrical and electronics equipment. Specifically, RoHS targets heavy metals used in electronic components like Lead, Mercury, Cadium, Hexavalent Chormium, PBB and PDBE. In order to comply with EU's RoHS legislation, all substances must either be removed or reduced to within maximum permitted concentrations. This applies to all electrical components that will be sold within the European Union. RoHS was introduced as law in European Union on July 1st 2006. Manufacturers caught putting non compliant products onto the EU market will face stiff fines and have their products barred. While manufacturers are primarily affected by RoHS, the law is also seeking to change how we as consumers handle our old electronics at the end of its life cycle. End users are advised to handle electronic waste as "hazardous waste", and dispose of old electronics through proper waste channels - not simply toss these items into the trash. As the RoHS symbol indicates, it is no longer okay to throw old computer gear into the dust bin.